As the end of my time here in Rome comes at full speed (23 days to be exact), my friends in my study abroad program and I have begun to discuss the ominous threat of reverse culture shock. We’ve had so many adaptations, so many lessons learned about how to “survive” in another country. Some of which I know I had to learn on my own, but some things which may have been useful to know going in. Over the summer, the International Studies Abroad (ISA) program (through which I am here in Rome) sent us all a digital handbook containing information on everything from budgeting to that cultural adaptation graph I mentioned in a previous post. But there was also a section pinned onto the end about some specifics of living in Rome. Unfortunately, this merely scratched the surface of the subject. Granted, I’ve learned enough to fill a book with during my time here, and thus it would be impossible to contain it all in an already thick handbook. Which is why I have compiled a short list for your own reading enjoyment containing some helpful hints to living in Rome that never appeared in the study abroad instruction manual. Possibly the coolest and simultaneously most frightening aspect of most Italians is their carefree attitude. This means there’s no baristas being overly polite to suit your “customer satisfaction” needs (probably also helps that tipping your waiter doesn’t exist). Sure, they throw obscene gestures and shout curses at each other when they cut each other off on the road (see #3), but you know they don’t really care. I actually wish Americans could take a tip from the Italians when it comes to this. They freely their express anger, but they don’t let it bother them for the rest of the day. They have their bout of passion and move on. Unfortunately, I eventually began to read this as Italians being unfriendly. But I realized how inaccurate this was after noticing how frequently random strangers try to talk to me. Even if it’s just asking me a question about where the bus is (see #2), it made me feel like I was finally blending in and at least looked like I knew what I was doing when they started talking to me. Sadly, my single semester of “Intro to Italian Language” has not served me to the point of having the ability to carry on a full-fledged conversation with the fast-tongued natives. It can be rather intimidating when they confidently begin rattling off their fluid and musical words at a mile-a-minute. Which is why I was thankful that the only phrase I learned before arriving in Rome was “Io non capisco l’italiano” (“I don’t understand Italian”). Most times I can get by with just a smile, nod, and repeating “sí, sí” over and over again. But I’m still grateful that they’re trying to communicate with me. Lesson learned: Italians are friendly, they just don’t care what you think of them at the end of the day. And that’s kind of cool. Public transportation in Rome is a nightmare, to describe it lightly. This is also a result of the nonchalant attitude but simultaneous passionate nature of the Italian culture. Apparently I was lucky this semester, since last year there was a bus strike at least once a week and during the entirety of finals week at my school (knock on wood). We’ve had a total of one day where the buses and trams shut down completely this semester, but even so, the buses are still notorious for disregarding the existence of a bus schedule. Case in point: it’s only a ten minute bus ride from my apartment to my school, but I still leave my apartment an hour before my classes start so I can make sure I catch a bus. Once you actually get on a bus, there’s a certain etiquette to follow. First and foremost, there’s an almost surprising respect for the elderly in Italy. It’s customary that if an older person gets on the bus, a younger person will immediately offer them their seat. I’ve even seen raucous Italian preteens yelling, shoving, and generally wreaking havoc with one another, but promptly stop to get off the bus and help an elderly citizen hoist their baggage and/or groceries onto the bus. Since the buses are frequently late, that means they can get crowded. I mean like sardines-in-a-can-crowded. I mean like disregard-any-notions-of-personal-space-crowded. I mean like I-hope-you-wore-deodorant-today-crowded. Be prepared to shove your way to the door, but rather than wordlessly plowing through the mosh pit, it can be helpful to know the simple phrase, “Scendo alla prossima” (SHEN-doh AH-la PRO-si-mah) which means “I’m getting off at the next stop.” Even when it’s not insanely crowded, people will frequently ask you, “Scende alla prossima?” if you are blocking their way to the door. Remain calm (see #1) and answer “sí” or “no,” and move out of their way. 3) Pedestrians don’t have the right of way. Back at home, in my quaint little suburban town of Louisville, CO, and even the (comparatively) bustling city of Denver there seems to be a high regard for the rule of pedestrians having the right of way in all situations. This is not the case in Italy. The roads are filled with smart cars and vespas taking advantage of their tiny size by zipping past each other at lightning speed. For not caring about being on time, Italians sure like speeding. I’m not sure I’ve seen a single speed limit sign while I’ve been here. Which is why the idea of slowing, let alone stopping at pedestrian walkways is utterly nonsensical. Thankfully, those tiny vehicles and their drivers do have a fast reaction time, so if you do walk out in front of an oncoming one, they will stop, they’ll just be sure to stop as close to your feet as possible to give you a good scare. Still, most locals don’t seem to risk crossing the street at an intersection until the pedestrian walk signal gives them the OK.
Oh, and I’ve never heard so much honking in my life. I didn’t expect something as simple as grocery shopping to be such a different experience, but of course, studying abroad doesn’t miss out on changing your perception of anything. I’m used to pushing a large cart around mega-Safeways and ultra-Targets, collecting as many items as will fit in the back of my car. But here, most folks walk to and from the grocery store, using little wheeled bags to transport their newly acquired goods home. Rather than using large push-carts, the grocery stores have little baskets that you wheel behind you, like a travel suitcase. I quickly learned that if the basket is getting too heavy to pull, that means I’m probably not going to be able to carry it back home. As I’ve mentioned before, the grocery stores are nothing like the ones back home. They are much smaller and carry totally different items. For example, there are entire separate aisles devoted to pasta and wine, but I can’t, for the life of me, find baking soda. Also be prepared to bag your own groceries. And try to do so quickly. 5) You’re going to become a coffee addict. 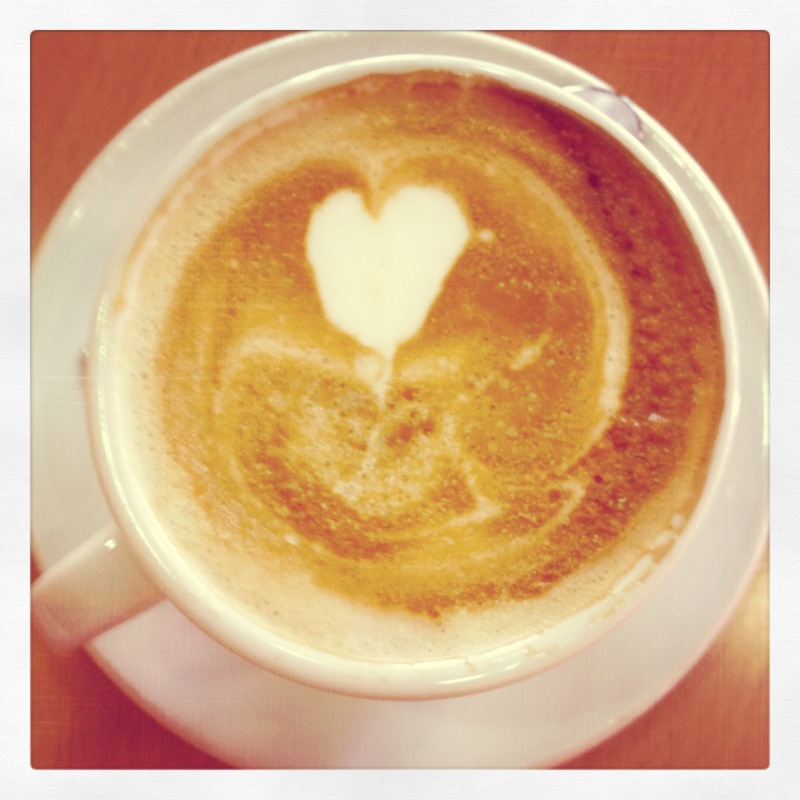 Don’t fight it: reciprocate the coffee love. Although I was a frequent indulger of coffee before coming to Rome, three of my best friends here had never tasted coffee or simply didn’t like it before their arrival. Now, they need one every day. A fair warning to all my friends and family: I’m probably going to be a coffee snob when I come back. Nothing can quite compare to the perfect temperature of the coffee and steamed milk and the fluffy foam that sinks to the bottom, allowing you to scoop it up with your spoon when all the liquidy goodness is gone. But above all, the gentle *plop* of the sugar when the foam gives way for it to sink into your warm cappuccino just can’t be compared. I plan on video recording that exact moment, so I may relive it while I choke down my skinny vanilla latte when I’m Stateside again. Thankfully, coffee is a major part of the culture here. But the primary difference is that cafés with ample seating and a welcoming atmosphere for you to take a load off and work on your laptop or read a book for hours at a time are not frequently included. Going out for a meal is a social gathering, whereas stopping by a coffee bar seems to solely fulfill the purpose of topping off your caffeine meter. These two seem to be switched in American culture. In fact, sitting at a café will often result in paying extra money. If you want to save the cents, remain standing at the bar. When you do pay, it’s often after you’ve had your fill and are about to leave. There’s a lot of trust that you won’t lie to the cashier about what you had. But why would you want to lie to the people who just fed you the drink of the gods, anyway? There are many differences between your old home and your new home and there are plenty of pros and cons that come with those changes. The whole point of this study abroad thing is to make your own “lessons learned list” and grow as a person while you’re making it. So maybe there’s not a manual for living in X country. There’s not a manual for life either.